We can supply elcontrol brand sockets & plugs for solenoid coils . 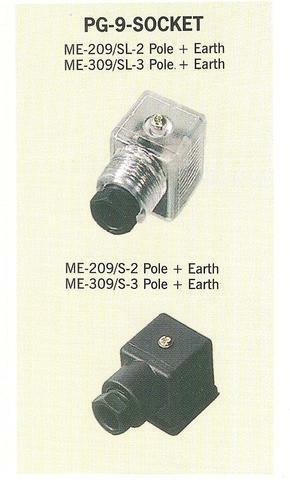 we can supply elcontrol brand solenoid plug & socket, suitable for 3 pin ( 2 pole + earthing ) & 4 pin ( 3 pin + earthing ) solenoid coils. h. V. Breakdown test: 2kv ac for 1 minute . insulation resistance: 100 m ohms min. Our company Shree Sai Enterprise was established in 1989. We are a leading trader of Control panel accessories, cable plugs, industrial electrical products, industrial switches, non adhesive tape, cable gland, multi pole heavy duty connectors, cable ties, relays, heat shrinkable sleeves, panel locks etc. The products that we offer are highly demanded in the market and attributing to its flawless finish, durability and easy installation. The range of high quality earthing sets offered by us has garnered immense appreciation amongst our valued clients.